Buy with Confidence! When you buy interior parts from Davies, you know you're getting the highest quality replacement and reproduction interior parts available on the market. 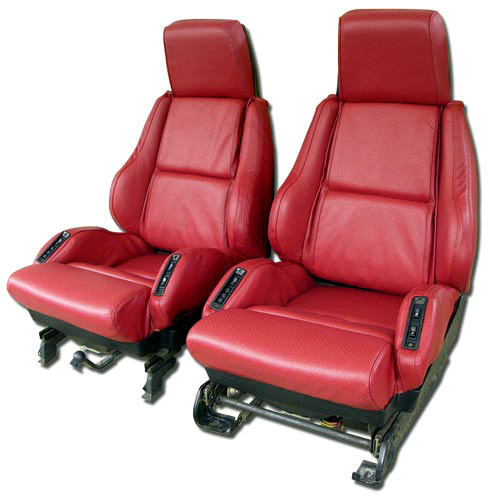 These leatherette replacement seat covers fit Corvettes with the AQ9 adjustable lumbar support option. Available with or without the original design perforations. Our leatherette seat covers offer you an economical alternative to the original leather seat covers, yet look just like leather! These seat covers are made in the USA with the highest grade leather-like vinyl offering durability that rivals leather. This seat cover set does NOT include the "Corvette" word embroidered in the headrest area that was original to the leather Sport seats. "Corvette" embroidering is included with our Original Leather Seat Covers with Sport. For white "35th Edition" seat covers with embroidery, please see our 1988 Seat Cover Set, original leather [sport with 35th edition].